Take the 'Cheeseburger Flatbread' (pictured above) for example. It is undeniably the most popular flatbread Grind+Grape serves. It offers savory and familiar ingredients that create a cheeseburger, smothered on top of a deliciously crispy flatbread crust. This flatbread manages to portray an entirely "all American" aesthetic without losing it's Italian inspiration. Perhaps it's the two worlds combined that attract so many to this unique serving. 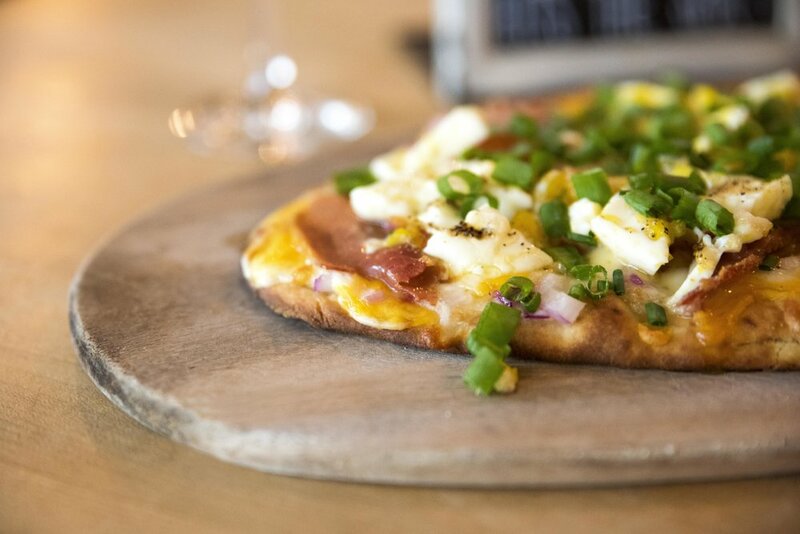 Another favorite, our 'Hangover Flatbread' is a breakfast pizza from your dreams. Picture your perfect runny egg with bacon breakfast, topped with fresh seasoning and herbs, but about 10x more filling and satisfying. Again, we see Grind+Grape giving us a taste of something we already know with just enough innovation to keep you wanting more. Comfortable, yet still a bit courageous. We now bring you, The Verace Flatbread. Unlike the afore mentioned, this flatbread sticks to it's roots. Sweet San Marzano tomato sauce, fresh basil, and parmesan make this a simple yet fulfilling choice. Though perhaps a complete 180 shift from it's menu mates, G+G is proud to bring you both innovation as well as predictability. Are you the type of person who wants to try something different or someone who loves the nostalgia of biting into something with memorable flavors? Both are more than welcome here at Grind+Grape and we hope you'll come and try the perfect flatbread for you. Happy New Year From Grind+Grape!